Debra Doxer can always be counted on for a well written, well designed story that is every bit as original as it is fun. With characters that are both lovable and memorable and even those that you love to hate, her stories really are something you don't want to miss out on. Her latest book, Like Candy isn't any different. With a main character that you almost can't decide to like or dislike and a swoon worthy leading man and mystery that you can't help but be captured by, this really was one that was hard to put down. Drama, intrigue, mystery, and a romance that kept me turning the pages and coming back for more, it really was something I wasn't expecting to like when I first met the sometimes shallow, and sometimes conceited, drama loving Candy. But like only Debra seems to be able to do, Candy's characters grew on me in the most unexpected ways and before I knew it, I found myself liking her and caring for her well being and happiness. I love the way this ended even though it was a cliffhanger simply because, I can't wait for more. There are so many questions I have about, well, everything and I can't wait to get them. Yay for swoon worthy men! :D That's more than enough to make me want to read this book. I've never read anything by this author but it seems like I'm missing out! She really is a great author Nick, I do hope you try something of her's soon! Oooo I love it when this happens Ali! It's always so much fun when an author's able to completely change your mind about a character over the course of the story:) Love the cover of this one too! I agree Jenny! And yes, I love the cover! There were a lot of really neat details on the pages as well! You will love it. It's different from her other stuff but still really well written! I like when the main characters is unreliable and you cannot decide if you like them. You have been on quite the mystery kick of late and keep adding books to my wishlist! It sounds like the character development in this is really fantastic. Thanks for sharing, Ali! I had her over a few months back, I should read her one of these days. I remember you reviewing her NA-thriller too, I know you liked that one as well. That's great Candy grew on you and you ended up liking her character more. Sounds like a really good book! I never of this before. I have students who been clamoring for more mystery reads, so I'll put this one on my tbr pile. I really like the sound of a character growing on you. Yay! I hope your students love it! Memorable characters is something I've really been wanting lately. I had just been thinking the other night how most of my current reads they just blur together. It's been a long while since I had one that really stuck like years go. Ones that I can still remember both hero/heroines names and all the storyline. I still enjoy the current reads but they all flow together. I love the books and characters that stick with you long after, they are definitely rare sometimes. Conflicting characters are the best! I like to be forced to stop and analyze like that :) This one sounds like a find! First - LOVE the cover. I haven't read anything by Debra Doxer before. This sounds awesome - Drama, intrigue, mystery, and a romance - all stuff I love - Great review! You will love this then and yes, the cover is awesome! Wow, this really seems to have it all, and I really love characters that grow on me slowly. I've never seen this book before, but I'll go add it to my Goodreads list. Yay! Happy to hear that Maja! This one sounds good! I love that it has some mystery too. I might have to add this one to the list! Oh I hope you do and that you love it as much as I did. 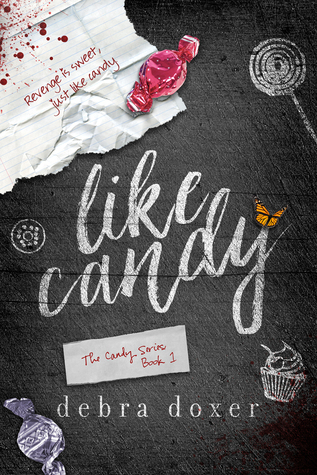 I'm glad that Candy grew and you liked her more as the book went on - I have a hard time with unlikable characters sometimes, but it sounds like Candy's worth waiting for! It can be hard sometimes but it was easy in this, probably because she did have redeeming qualities throughout. This sounds fantastic, Ali! I love that it has everything in the mix, yet it seem to have worked. Adding this to the big pile! It's great to have an author like that. Plus I hope that the sequel will be as good now! Thanks, I'm really hoping so as well. I love mysteries, and this sounds like an awesome one. Though considering the cliffy, I'm gonna wait for at least book #2 to come out before diving in. Well she isn't an assassin yet, but she wants to be! I love books about revenge. I'm keeping my eye on this one. You mentioned lovable characters, too?! Have to check it out. So glad you liked it too and thanks for the nomination! Ah cliffies kill me! Still I'm glad the characters grew on you and super happy to hear there's a swoonworthy romantic lead. I haven't read anything of Doxer's so this would be a great choice for me. I do hope you try this or at the very least something else of her's.